Summary: This walk in the far west of the Lake District visits a series of interesting fell tops, one having a superb view of Ennerdale Water and Pillar and another enjoying one of the best view of the Irish Sea and Solway Firth. While never being precipitous it is an undulating and invigorating walk. Living in Yorkshire it is only when I visit the Lake District for an overnight stay that the far west of the Lake District is within reach so as I had a few days to spare in November I planned a four day walking break in the National Park and designed this shorter than usual Wainwright fells round as the warm up walk. 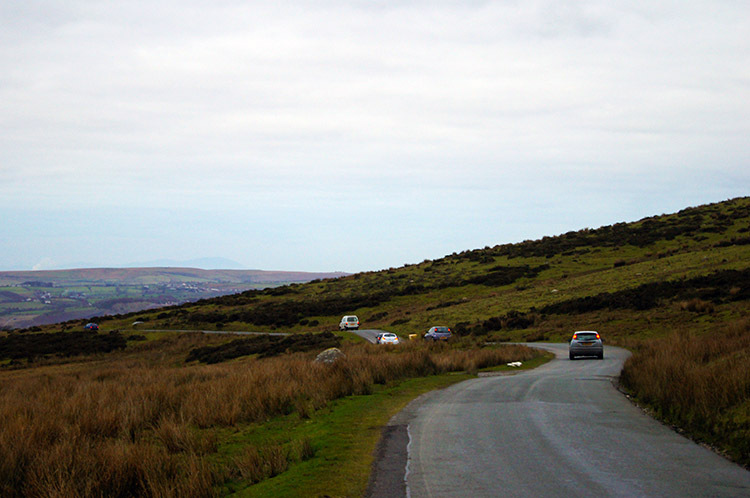 After an early morning drive over from Harrogate I arrived at the start just before lunchtime and having parked up in a convenient pull in area near Scaly Moss I set off on my merry way by ascending on the open fell side of Blakeley Moss. 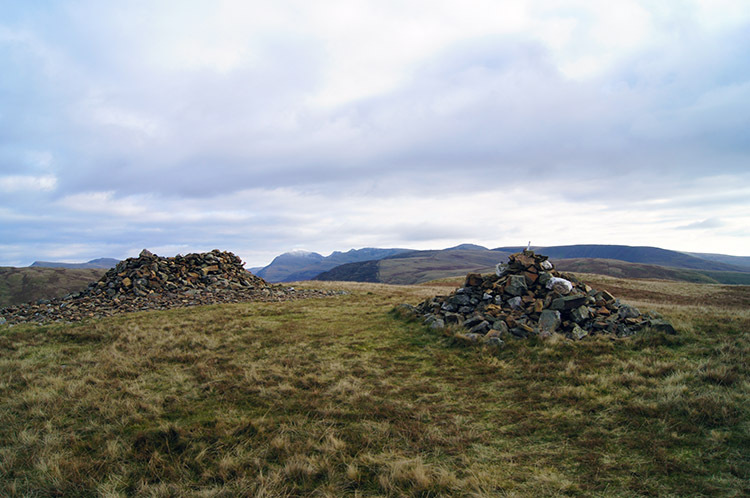 I had intended to walk through plantation to follow a straight course to Grike, as the track downloads show, but I missed the gate having veered to the right and instead I enjoyed the bonus of ascending to the rounded summit of Blakeley Raise. No harm done in the short detour which was caused by walking straight up the fell without checking the GPS line, I had a good sight line of Grike from my new vantage point. The fell top country surrounding me was brown with hints of green here and there as is normal for the Lakeland uplands in late Autumn and early winter, unless under a blanket of ice or snow that is. The grass underfoot was short and tufty, good for walking across and so I made easy progress on the descent from Blakeley Raise to the hollow of Kinney How where I should have been had I attended my planned course. 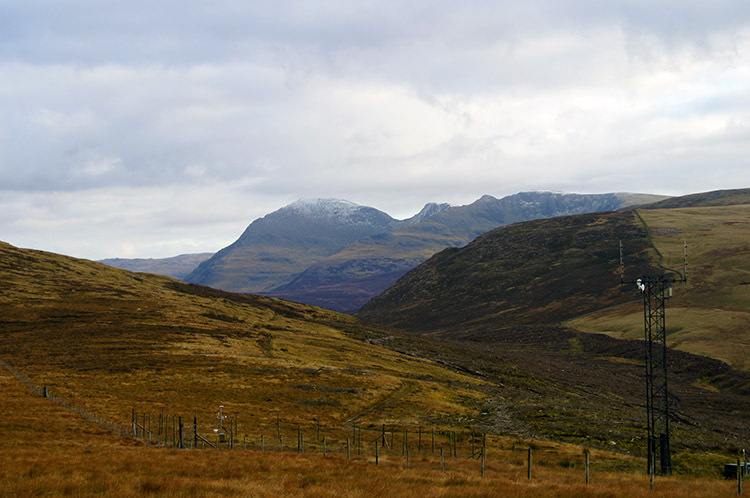 From Kinney How I followed the good vehicular track made for the wood carrying vehicles which had recently cleared the plantation of its trees before leaving the track by heading up thought a short section of wood stump to a stile which gave me access to the upper slopes of Grike. After one field and another stile crossing I was on the final stretch of climbing to the top. A couple of minutes later I levelled out to reach a couple of substantial cairns which signalled the summit of Grike. I paused for a while at the summit and then spotted a couple with a dog approaching the summit from the west, presumably via Heckbarley. 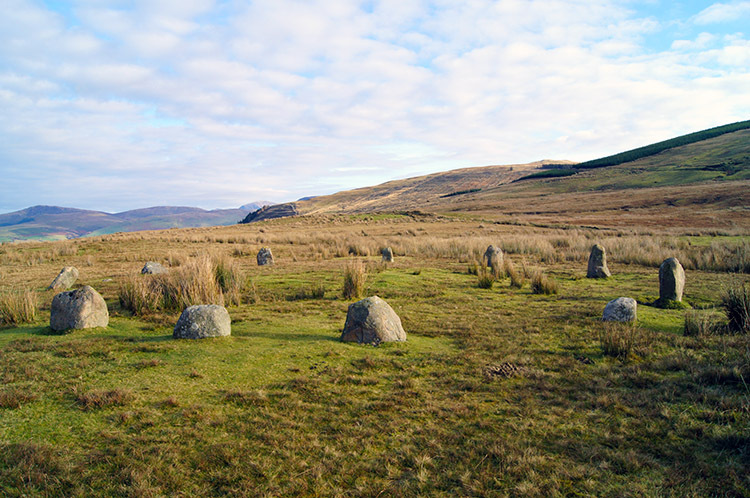 On chatting they disclosed they were from Devon and while Dartmoor was once their familiar walking area they had moved to Ennerdale because of the wider choice. I understood their reason. 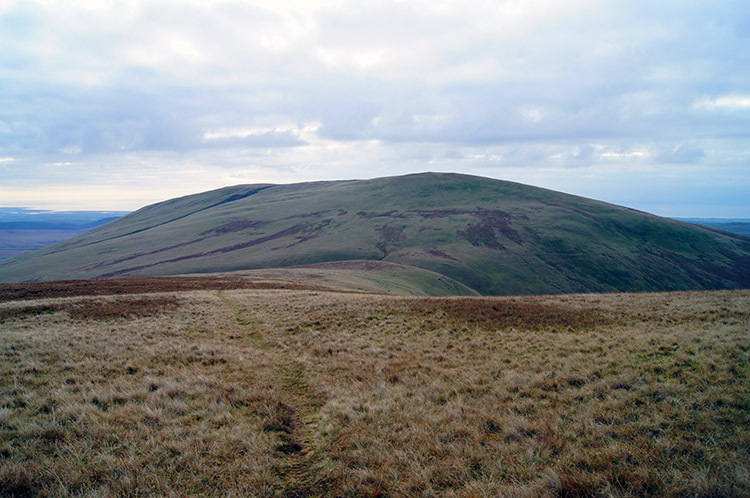 After my chance meeting with the Devonians I continued on my course by descending from Grike in an eastwards direction towards Crag Fell, my next point of call. As I strode down the fell I could not help to be heartened by the west facing profile of Pillar, a sight unseen from this angle before. The magnificent rounded dome of the top was unfamiliar as Pillar hides behind others on all of its other aspects. With a sugar icing coating of snow on the top it was tremendously alluring. Beside Pillar and just forward of it to the right was the small craggy hump of Steeple. This walk would have more great views to credit it but I would have walked here for this view alone. One to savour and forever remember. From lesser known walks and along paths to indistinct fell tops often brings great reward - this is the attraction of walking on new paths and exploring. And after climbing the plain south west facing slope of Crag Fell I came to another. 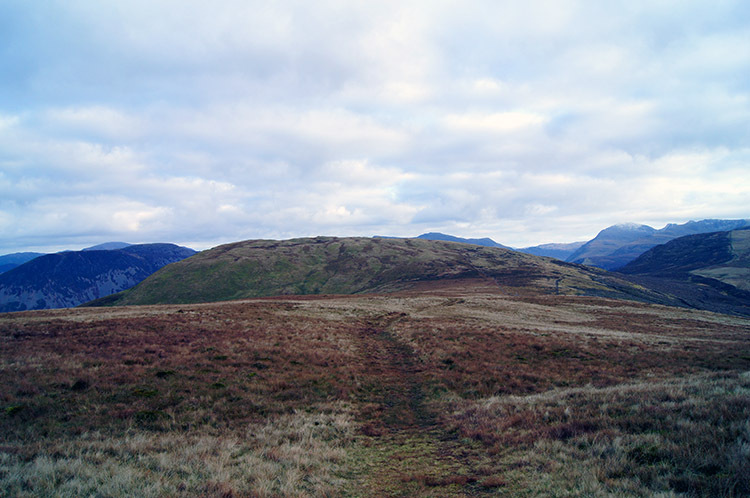 Wainwright said the north face of Crag Fell is so craggy that it can be mistaken for Pillar but from the south west it is no more than an even slope of grassy fell. However from the summit the view east is brilliant. Ennerdale Water and the valley of Gillerthwaite beyond is beguiling and though Wainwright bemoaned the forest of conifers planted in his time they are now gradually being part replaced by deciduous to give a more appropriate view. Still, plantation green is good itself in the deep of deciduous winter so they were making a nice contrast for me. And then I could look to the north side of the valley to cast my eyes on the Great Borne, Starling Dodd, Red Pike, High Stile High Crag and Haystacks ridge which I walked across during my Coast to Coast walk in 1999. And on the south side of the valley I could again look to Steeple and Pillar. A great scene indeed. Once I left the exposed top of Crag Fell and the views of Ennerdale Water a Gillerthwaite behind the contrast in view could not have been greater. 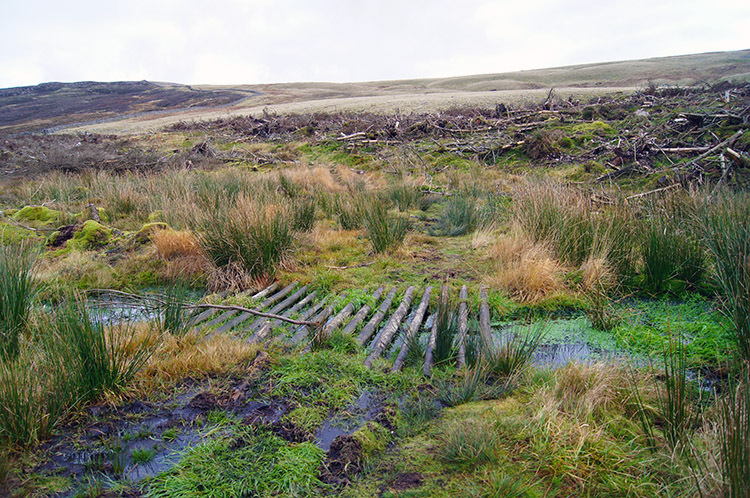 I headed south and crossed a small stretch of indistinct moor before descending to another area of felled plantation which was like a quagmire to cross. Conveniently wood boards and pallets had been left to ease the crossing of the lowest part of the pass before I climbed on good turf ground to Whoap, a hill of no real shape but with a name which really appealed to me. 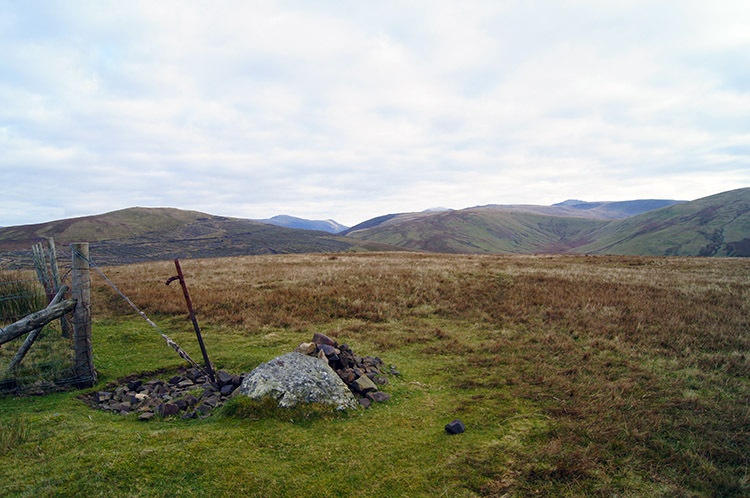 On reaching the slightly domed top of the hill I could see my way to Lank Rigg, my third and final Wainwright to visit on this walk. A clear path would lead me there. Good old Whoap I thought! 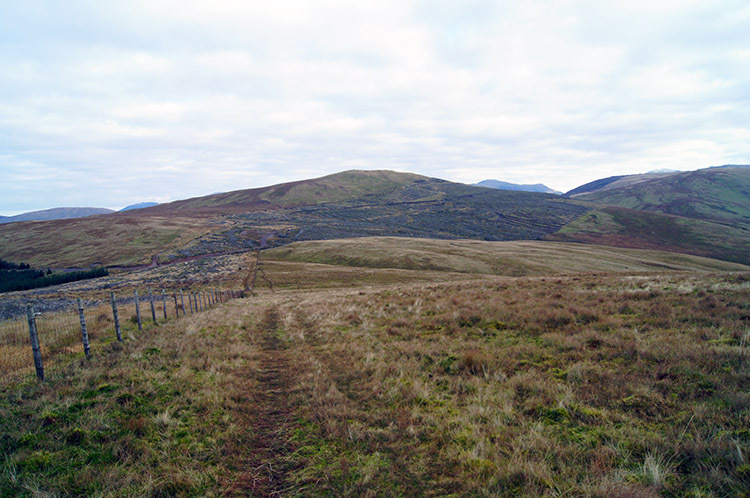 I enthusiastically bounded on the path leading directly south west from Whoap to Lank Rigg. 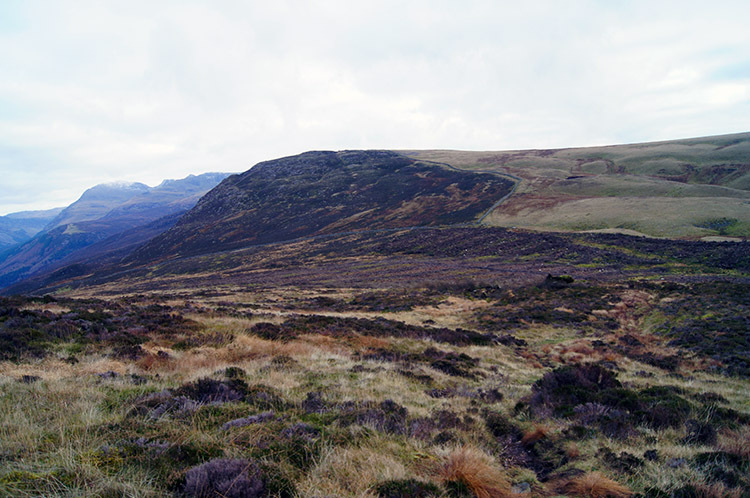 It was just about a kilometer between the two, the first 500 metres taking me down 80 metres and the second 500 metres taking me up 100 metres to the summit of Lank Rigg which stands at 541 metres and which was the highest point of the walk. From Lank Rigg the views were far for the whole 360 metre panorama though much different in attribute. Inland the mountains to the north, east and south are plentiful but too far away to be made out unless a specialist. It was the view below to the west which demanded the attention with two man made giants being the most obvious. 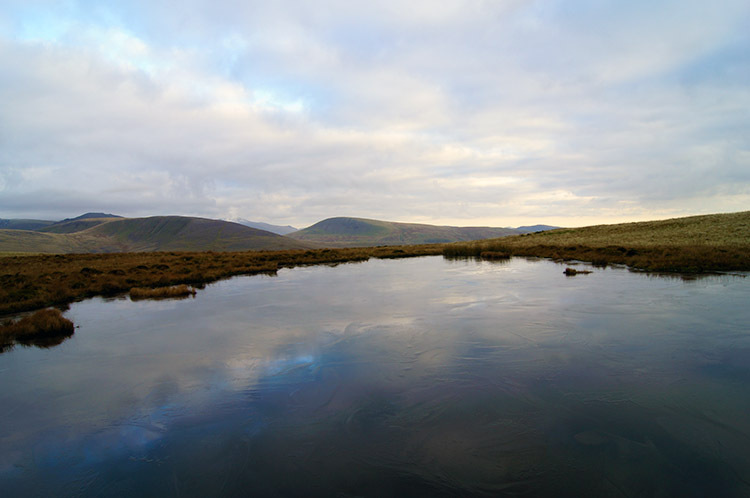 The closest on the coastline six miles south is Sellafield Nuclear Power Station and then at Walney Island in the Irish Sea there is the largest offshore wind farm in the UK with its 102 turbines (and counting) I looked over these essential but ugly energy providers before looking back into a lovely small natural tarn close to the summit of Lank Rigg and reflecting. I tried to focus on the natural landscape. 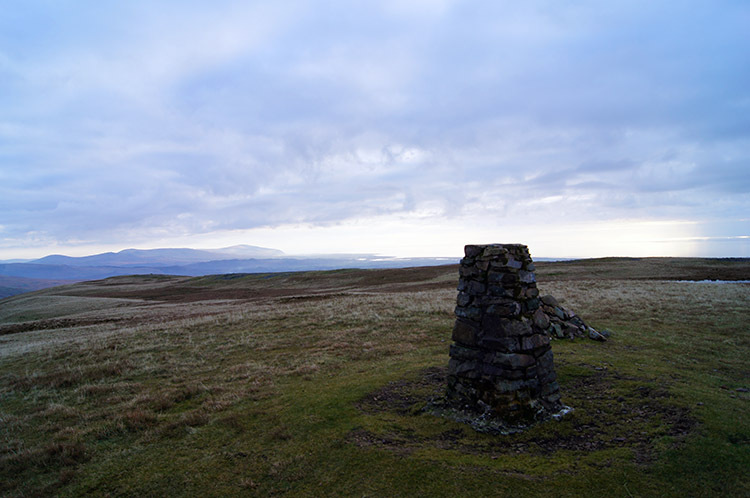 This I did by leaving Lank Rigg and looking straight ahead, in a north east direction as I began my descent to Lankrigg Moss. Straight ahead in the far distance I could see the more alluring sight of the south east Scotland coastline and mountains of Dumfries and Galloway on the north side of the Solway Firth. I often think I should walk in the area one day when looking over but never do. 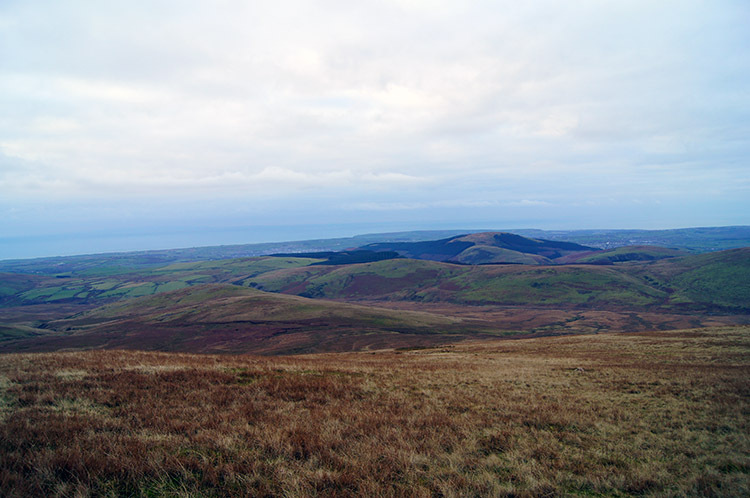 Perhaps I will manage to do so one day... As the view disappeared so did my thoughts of Scottish conquest and I focused on staying dry in the depths of Lankrigg Moss. As I got lower into the bowl the ground got wetter and my boots often sunk underwater. 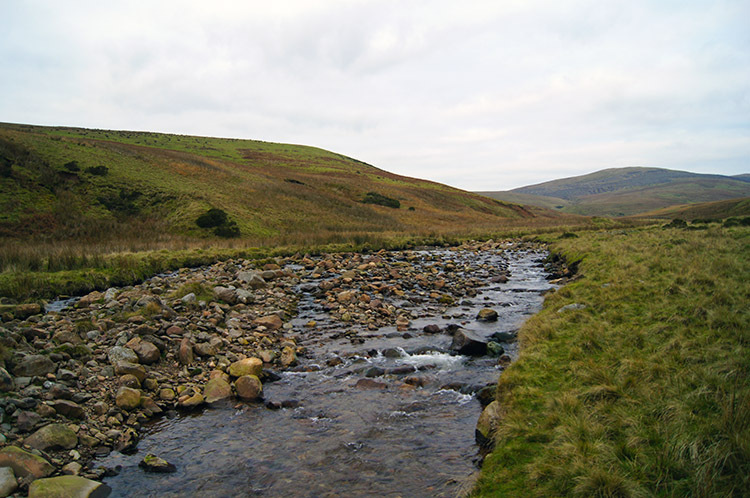 here were no clear paths either but the course was clear and I bee lined to the banks of the River Calder which after reaching I halted. I walked up and down the bank of the river looking for sometime assessing the best place to cross. Eventually I picked my spot and crossed, immediately climbing up the side of Bomery Gill after reaching the other side. 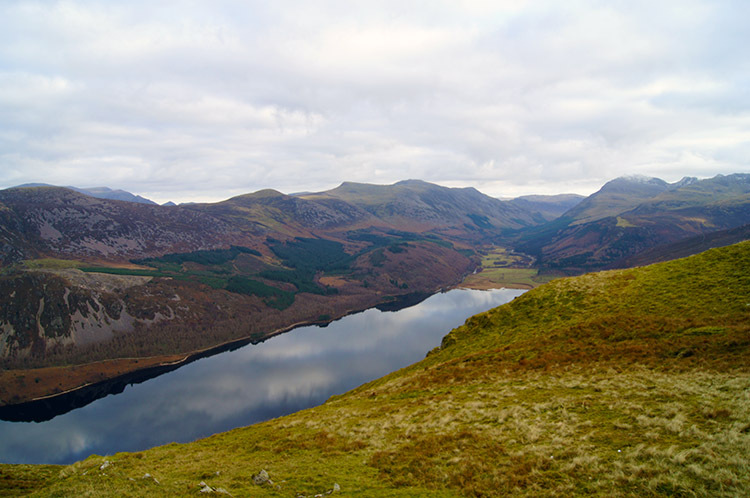 I climbed up to the top of Bomery Gill and soon after came to the road linking Ennerdale Bridge and Calder Bridge. It was getting dusky, not much light left in the day and a steady stream of traffic were heading north. Few cars passed going south so I guessed an early shift from Sellafield must have been making their way home. As they commuted I walked steadily along the roadside in the same direction back to my starting point over the brow of the hill and past Sillathwaite Wood at Scaly Moss. 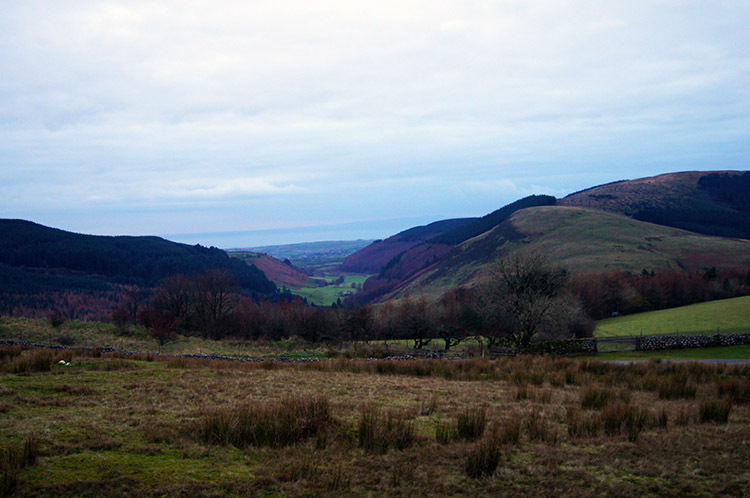 As I made my final paces along the road I looked due west and down into a picturesque valley. It was Uldale which I walked through east to west in 1994 and west to east in 1999. Great memories both as they will be of this walk, a thrill to be in a quiet corner of the lakes and apart from the chance meeting on Grike I had it all to myself. Great.